Dontnod's Life Is Strange persevered against the odds. It was an adventure game, dressed in a familiar model popularized by Telltale Games. It told a down to earth story about a teen girl who moves back to her hometown, and how she deals with love, (or not, depending on how you play it), friendship, and the consequences of the choices she makes, whether she has control over them or not. Oh, and you play as a girl with the power to rewind time, because what teen girl doesn't wish she had that power? 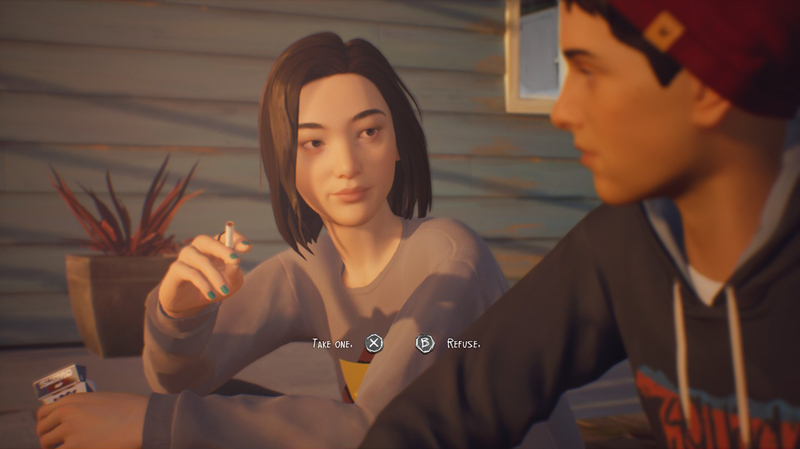 Life Is Strange 2 has no direct relation to Life Is Strange, though a big choice you make in the first series is directly reflected in the new series' debut episode. Instead, the two games take place in the same universe; on the same coast. The connection is in how they're both about real-world issues at their core, given a supernatural twist. 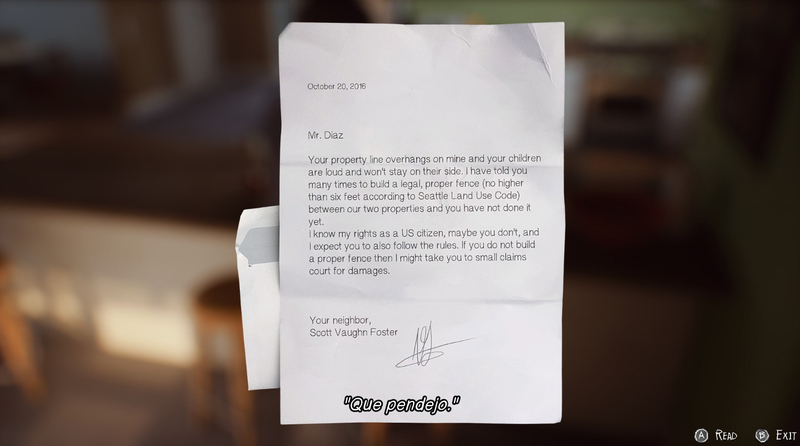 In Life Is Strange 2, you play as Sean, an older brother thrust into a caregiver role after he and his little brother go on the lam following an event that leaves two people dead, including a cop. But before that, we get a taste of the two brothers' home life before things get turned upside down. Sean's skateboard kid-like edge immediately feels familiar to me (unlike Chloe's Hot Topic-imbued "punk" from the first series), and his home life does too. His dad is a good dude who cracks a lot of jokes and values honesty above all else—when I was Sean's age, I was honest with my step-dad about drinking and whatnot like Sean is, and he'd just impart the "be safe" wisdom and tell me to call him if I needed a ride. Sean's dad is the same way. It's pretty much the opposite living situation of the not evidently-related yet The Awesome Adventures of Captain Spirit prequel from earlier this summer. You get some time to wander around Sean's home before the scenery swiftly changes while gathering stuff for a party you're supposed to head to later. This opening is where it feels similar to the first game, which largely took place in Arcadia Bay, Oregon. Then Life Is Strange 2 flips this familiarity on its head—now we're roughing it in the woods, clothes tattered, hungry and alone. And so, Sean and his 9-year-old brother Daniel are left hiking through the woods of Washington and Oregon, en route to a town in Mexico where their dad grew up. Life Is Strange 2's prequel The Awesome Adventures of Captain Spirit contrarily suffers from many of the downfalls the original series did. Only Captain Spirit also had an overbearing tweeness to it, something I was worried would follow into Life Is Strange 2. Luckily, so far it hasn't. Life Is Strange 2 is grounded in a way that the first game felt at its best. But it's not without its own offbeat inconsistencies. In my notes for the episode, I scribbled why does this high schooler only listen to late 2000s indie rock in 2016?? ?, with that exact punctuation. At the start of the episode, we hear the energetic guitars of Phoenix's hit "Lisztomania" first over a montage of a suburb in south Seattle and then quietly buzzing out of our hero Sean's earbuds as he walks home from school. Later, he listens to The Streets alone in his room, singing along to himself from time to time. A Bloc Party song circa 2005—embellished with an excited "do you remember this song"—appears later. 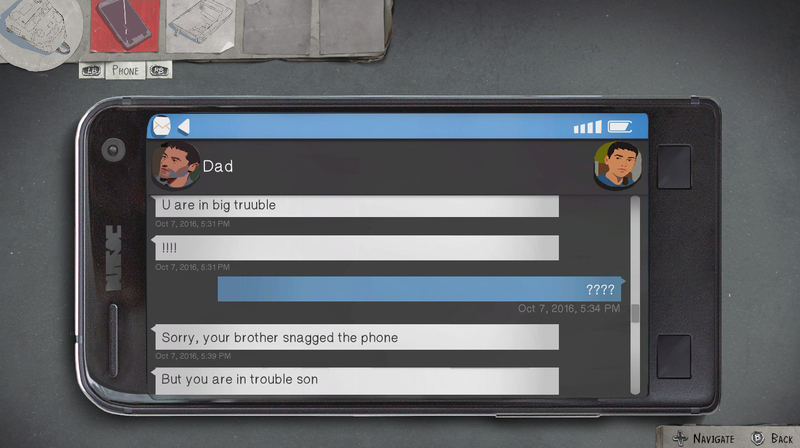 There's lots to uncover in looking at random objects, including this cute text exchange after Sean's dad found a lot of weed in his son's room. This probably makes me sound neurotic. But I'm 25 going on what feels like 35, and when I was Sean's age, I was listening to these very bands because they were semi-new. With such song choices just in episode one, I'm counting down until Grizzly Bear's "Foreground" soundtracks a sad moment, or an episode opens with a Peter Bjorn and John song. It's not bad licensed music, it just feels out of place for a game about a 16-year-old set in 2016. Sean strikes me as the type of kid who's really into Mac Demarco, or something else that makes sense for a teenager his age. I was hesitant on the premise of Life Is Strange 2. While I'm not the biggest fan of the first series due to its frequently cringey dialogue, the sweet core of it is undeniable. It's relatable in a way most games aren't, mechanizing what it's like to be a teen girl with more emotions than she can handle. The missing persons mystery at the center of Life Is Strange is what always struck me as the worst part of it alongside all the good, but Life Is Strange 2 tosses that conceit away for a simpler thread: life on the road, and what brotherhood can withstand. In episode one alone, you meet a bunch of people. There's a racist white dude who threatens to call ICE on Sean and Daniel; there's a guy who's the embodiment of a diehard NPR listener—insufferability, good intentions and all. It's a rocky journey—especially along the coast of a state that has the highest rate of hate crime reports per capita than anywhere else in the United States. And it's only the beginning. 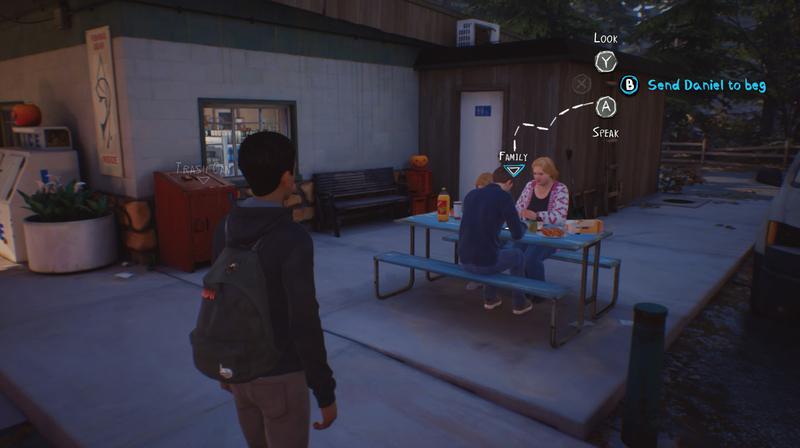 Mechanically, the biggest change to the Life Is Strange formula is the inclusion of Daniel, which essentially adds another layer to every choice you make. As his older brother, every decision influences Daniel, even the small ones. For instance, if you don't play with him when he asks, he may get sad and confused; if you shoplift, you're a bad influence. There's a lot of different factors to their relationship, and how you balance everything feels like it matters—though the final impact of our choices aren't truly evident yet. Blue colored choices involve directly interacting with Daniel, such as asking him to do something. Daniel runs around freely too, doing his own thing a lot of the time. Sometimes he'll pause at something and if you make it over in time, you can interact with him to initiate an action such as teaching him how to skip stones across a lake. I imagine in the later episodes, these teensy choices will directly shape Daniel. Without a rewind power or any equivalent (the power in this game doesn't lie in Sean whatsoever), the idea of quietly shaping another character adds the extra layer that Life Is Strange 2 might otherwise be missing. Life Is Strange 2's debut episode, despite its faults and its slow-moving pace, starts the series off compellingly, setting off on a road trip adventure that I'm sure will bear more hardship for the two brothers than unlikely friendships. It's telling a very different story from its predecessor, but thus far it retains the most important element: making us care about the characters, wherever the journey takes them. From this point onward, we are going to abstain from scoring episodic games until the entire season is complete, effectively holding off on our official verdict. Look forward to our reviews of each episode in Life Is Strange 2 in the coming months. Tagged with Adventure,	DONTNOD Entertainment,	Life is Strange,	PC,	PlayStation 4,	Reviews,	Square Enix,	Xbox One.